So, I’ve been living in Japan for the last six and a half years and I’ve had my share of both good and bad experiences. Taking everything with a grain of salt is a lot easier now than it was when I first got off the plane at Chitose Airport. Thinking back to that time really gives me some perspective on how far I’ve come with my comfortability in living in Sapporo. Being a complete fish out of water at that time didn’t come without its hardships. Learning my way around, finding healthy food to eat, communicating without a smidgen of Japanese study under my belt all provided me with annoyingly unique roadblocks to deal with. The job I was given, which also provided me with the opportunity to live in Sapporo, of course, was teaching English. I have to say, if it wasn’t for a deep desire to live in Japan, the environment of my workplace would’ve driven me back home in a heartbeat. It had only been a few months and I was already doubting if I’d made a good decision to come here. Imagine working in a place that made you feel like an unwelcome guest everyday. On top of that, having a boss that didn’t speak any English and who would react like a frustrated animal whenever you offered a positive solution or voiced a concern. I’m from America, and was used to getting praised for such things and held in regard for having a good work ethic. Needless to say, things had changed dramatically since those days, and to my dismay I was looking for the backdoor. It was my 28th birthday the June of my first year in Sapporo. I was lucky to have the same night off with a coworker of mine from America who worked for another branch of my company. We were both feeling the same way about our situation and stuck in a rut to a degree we never thought fathomable. We would usually spend our nights out complaining about work and making jokes about life in Japan. That night, we decided to put all that on the back burner and focus on having fun; it being my birthday and all. 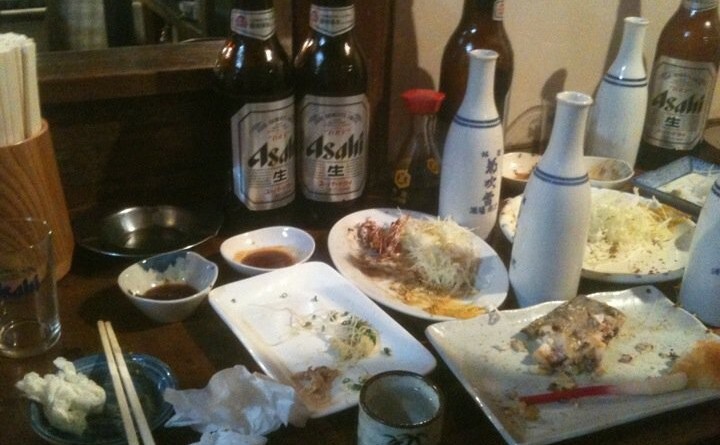 We ducked into a local izakaya, (Japanese tavern) which I had heard about from a previous co-worker. This place was known for its warm atmosphere and amazing yakitori. We were seated at the counter right in front of where the owner and staff cook, take orders, and mingle with the locals. The center of the action, so to speak. 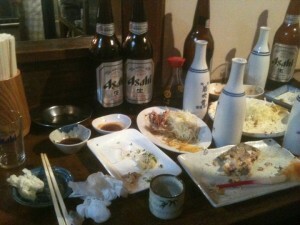 We started off with a few beers, as is the tradition at an izakaya, especially among co-workers. After a few minutes had passed, the head chef walked over to us and started making conversation. He had this smile on his face that one would only see from a best friend or relative. Immediately, we started feeling more relaxed and connected to the atmosphere. The chef had a pretty decent level of English, enough to make joking and friendly conversation. My friend mentioned that it was my birthday and things started to escalate very quickly. Before we knew it, we were getting treated for drinks by the owner as well as the patrons. Everyone was so curious about us, as well as what our interest in Sapporo was. The best part about it was, we were being treated like equals, and those around us didn’t seem hesitant or nervous about being with us at all. They truly enjoyed our company, as we did theirs. As the night progressed, I was presented with a cake made of yakisoba (Japanese fried noodles), which was one of the house specialties, I was told. Somewhere along the line, my friend mentioned that I was single so, as a joke, or a suggestion (I’m still not sure today) the owner took his daughter to the back room, wrapped a big bow around her, and presented her as a present to me. I couldn’t believe it! I was so happy, but also embarrassed not knowing what to say or do. I quickly realized it was a joke and all in good fun, although the owner might have had a more serious intention. She was such a good sport about it. She actually sat on my lap for the remainder of the evening and my friend and I enjoyed chatting and trying to communicate with her using gestures. I’ve never felt so welcomed in my entire life. It became clear to me then that Sapporo was not the kind of place I had lead myself to believe it was. It was a very genuine place with good, fun-loving people, who want to make new friends regardless of where a person comes from. Even now, I can still picture and feel that enlightening moment in my mind. Whatever tension and negativity I had built up till then quickly melted away. My co-worker and I both had work the next day, so we had to call it a night. Reluctantly, we decided to pay our bill, which happened to be very reasonable, and head back home. Everyone was so sad to see us go, especially, the owner and his daughter. We felt bad leaving but we knew we would be back soon and to no surprise, we were. In the years that passed, I frequented that izakaya often and made lifelong friends there who constantly made my life easier and happier than it would have been had I never been there. They gave me the grounding I needed to make a good life for myself here in Sapporo. They also gave me the ability to take everything in stride. I could now look at my experience here from an outside perspective and not dwell on the inconveniences and misfortunes of my job. I know it can be challenging to start a life in Sapporo. When things don’t go the way we expect, we often focus on the negative and constantly look for excuses to justify returning to our home country. My advice is to remain open to the people around you and embrace the chances to make new friends and have new experiences. The people of Sapporo really appreciate good-natured, authentic, positive people. If they sense that you are one of those, they will do their best to make you feel comfortable here and help you in any way they can. In Sapporo, a job is a job, but friendships are true and priceless. Don’t miss the opportunity to create a great life for yourself here.